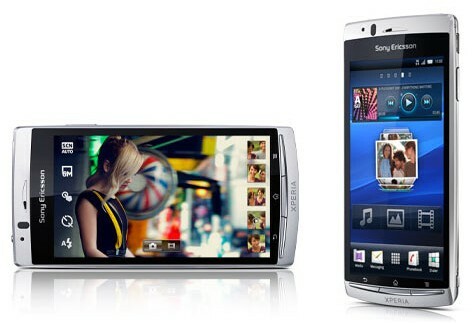 Sony Ericsson today announced the upcoming availability of a super phone, Xperia arc at the annual CES in USA. The Sony Ericsson arc will be the next flagship product in the Xperia family of smartphones that are using Google’s Android OS platform. Currently, we have Xperia X10, Xperia X10 pro and Xperia X10 mini in this range, and all are using Android OS 2.1 Eclair with custom Sony Ericsson UI. The first thing we will notice in Xperia arc is the sleek, stylish design and curved rear side. Sony Ericsson uses a special display device in Xperia Arc that they call a Reality Display. The display is supported by Sony’s Bravia Engine Mobile, a technology that will deliver crystal clear images and videos by nose reduction, color management and other enhancements. Reality Display in Xperia Arc is of 4.2 inches and has 854 x 480 pixels resolution. It is externally covered with a scratch-resistant glass. The front side buttons in the Arc resemble old Xperia models. Coming to OS, Arc will be shipped with Android OS 2.3 Gingerbread and is upgradable to OS 3.0 Honeycomb when it comes out. The 8MP camera is another great feature in Xperia arc. It uses Sony’s Exmor R sensor that provides high-end picture quality, better sensitivity and low noise in all atmospheric conditions. The device supports HD video recording at 720p, and has a front video camera of VGA quality. When looked at the internal side, Xperia Arc is driven by a pretty old 1GHZ Snapdragon processor and there is around 512MB of RAM. The package includes an 8GB card, and the storage is expandable up-to 32GB using Micro-SD slot. The data transfer options of Sony Ericsson Xperia Arc shows a Micro HDMI port for connecting with external HD device. Other notable specifications of Sony Ericsson Xperia Arc includes 3G at HSDPA, Bluetooth with A2DP, Accelerometer, proximity sensors, TimeScape/MediaScape UI, FM Radio, GPS, Bar code scanner, Document reader, Li-Po 1500 mAh battery, Digital compass, inbuilt Google Mobile apps, etc. Sony Ericsson will launch Xperia Arc in the first quarter of 2011. The price and other details of Xperia Arc are not yet announced. But considering the specifications and the normal Sony Ericsson pricing strategy for new products, we believe that it would cost around $750. Update: Sony Ericsson Xperia Arc price in India- 29000. Sony Ericsson Xperia Arc seems to be a nice looking mobile phone set – I guess its going to be the best among the rest of the Xperia family mobile sets! Sony Ericsson has stated it will not release Android upgrades for the Xperia line. If you purchase a SE Arc, there is no way of knowing if down the line they will do the same to that handset. “We have not had pre-decided tactics to wait as long as possible to let our users know that we are not going to give Froyo to our X10 phones or X8. So, a word of warning if you are considering a SE Arc: You could be hung out to dry if you purchase any new Android Smartphone from SE.